Upon returning, Dorothy finds that heroic tasks again await her — and that in Oz Halloween lasts an entire witch-week of thirteen days! Mysteries abound. Why does she arrive in Gillikin Land, where she has never been before? Where is that evil that her father warned her about? Who is this mysterious boy with purple hair, who seems to be a friend from Kansas in disguise? 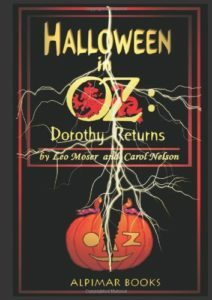 Old friends like Scarecrow, Tin-man, and Lion — and new friends like the mysterious boy and her Kansas pumpkin magically brought to life — help her and Toto struggle in what becomes a battle to save Oz.